Rinse the rice 2 or 3 times and drain. Add the rice, water, bay leaf, cinnamon, cloves, turmeric and salt to a medium size pot and bring to a boil over medium-high heat. Cover, turn the heat to low and cook for 10 minutes. Remove pot from heat and let sit, still covered, for 10 minutes. Uncover and remove the bay leaf, cinnamon stick and cloves. Add butter or oil and stir. • If you want to substitute another type of rice (basmati, brown, etc. ), increase the amount of water and cooking time according to the package directions. My dad bought me madhur jaffrey’s world of the east vegetarian cooking when I left for college and I’m obsessed. Although it was totally one of those gifts that took me years to appreciate. Thanks for both of these awesome recipes!!! This recipe says to cook 2 chips of rice with 2 cups of water. Is that a typo or is there something I’m missing? No, it’s not a typo — I prefer the more distinct texture of rice cooked with a 1:1 ratio of water. Many American rice recipes call for 2:1 water to rice ratio, but I find this too mushy for my tastes. 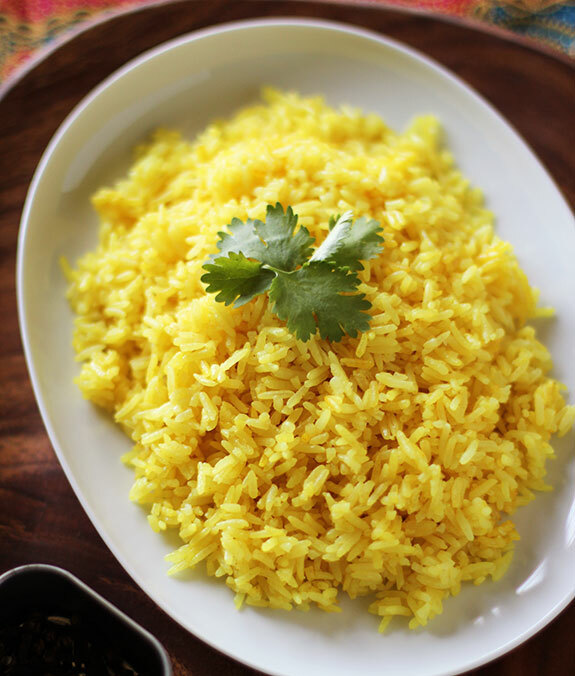 Give this recipe a try as written — you may find a new favorite style of rice! Thanks for the feedback! I tried making the rice with the 1:1 ratio, but it was too crunchy for my taste. The flavor of this rice paired with the lentil dish was amazing!! Given the flavor palate, I think I might be able to substitute brown rice in next time for an even healthier meal. Thanks so much for posting! Did ur rice really only cook for 10 min?! Is there a way to make this in a “rice cooker”? Yes, just prepare the rice as you normally would, placing the seasonings in the cooker with the rice and water. do you think subbing in ground cinnamon would work? if so, how much would you try? thanks! Wow. I made it in my rice cooker and far exceeded expectations. Substituted ground cinnamon and added cardamom pods. Absolutely fantastic! And it smells great cooking.